This might sound crazy but I want you to know about a guy I just met last Friday who passed away two days later before I could thank him for his kindness. 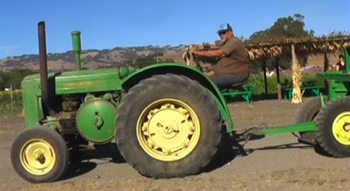 His name was Bob Crandell, the operator of the adobe Pumpkin Patch hayride that you see in this picture, and in the video below. It was getting toward the end of the day and I was running around the grounds with my video camera and decided it might be a good idea to ride on the wagon with the people for some cool shots, so I ran up to Bob while he was driving along and asked if I could hop aboard. It wasn’t until I made the request that I realized I might be asking him to break the rules because there are probably safety issues and boarding in the middle of a “round” could be considered risky. I was just about to retract my request when Bob slowed the rig down to a crawl and told me to hop on. He then proceeded to ask the other riders to make room for me at the front of the wagon, and drove me around that place until the camera battery finally ran out. The resulting “footage” that Bob helped me capture was just what I needed to put the finishing touches on the production, and I would not have been able to do it without this big, quiet guy behind the wheel providing the extra effort to help make it so. I told myself I was going to look him up the next weekend and thank him for his consideration, but I never got the chance. I guess the lesson to be learned here is that every act of kindness, regardless of how small, means something to someone, kids… so PLEASE be nice to everyone while you still have the opportunity. Rest in peace Mr. Crandell… and THANKS!